In this photo taken on August 5, 2017 shows (L-R) Malaysia's Foreign Minister Anifah Aman, Myanmar's Minister of State of Foreign Affairs U Kyaw Tin, Thailand's Foreign Minister Don Pramudwinai, Vietnam's Foreign Minister Pham Binh Minh, Philippines' Foreign Secretary Alan Peter Cayetano, Singapore's Foreign Minister Vivian Balakrishnan, Brunei's Foreign Minister Lim Jock Seng, Cambodia's Foreign Minister Prak Sokhonn, Indonesia's Foreign Minister Retno Marsudi, Laos' Foreign Minister Saleumxay Kommasith and ASEAN Secretary-General Le Luong Minh applaud after joining hands for a family photo during the opening ceremony of the 50th Association of Southeast Asia Nations (ASEAN) Regional Forum (ARF) meeting in Manila. The Association of Southeast Asian Nations (ASEAN) has a busy year ahead. But the buzzword on the lips of regional policymakers and influencers – “economic community”, “free trade” or “trade integration”, just to name a few – speaks to the potential of the region in terms of its economy. While dollars and cents are undoubtedly important, economic prosperity alone, won’t ensure ASEAN’s success. For ASEAN to be truly be a triumphant feat of regional integration, its peoples need to be more integrated. Before Brexit and the eurozone crisis, the European Union (EU) was hailed as the ultimate model for regional integration. However, the European integration project – with its ambitious economic goals – could not achieve a population that would refer to themselves as European and not German, French, Spanish or Dutch etc. ASEAN could fall into the same trap if it places emphasis only on economic integration and neglecting social integration. But the latter is no easy feat to accomplish. Where the motivation for economic cooperation is financial prosperity, the motivations for social cooperation is less tangible. Because the recipients of any regional economic initiative are citizens of members within the regional bloc itself, it makes sense for there to be some level of integration amongst the citizenry. The necessity for social integration was never more apparent in Europe than during the Greek debt crisis. Germany’s harsh austerity measures were popular with Germans but were treated with disdain by the Greeks. Germans labelled their European counterparts to the south as “lazy” and “corrupt” for allowing the crisis to fester and then affect the continent. The greatest lesson ASEAN can learn from this terrible mishap is to not exclude its citizenry on regional trade plans and policymaking regardless of its complexity. 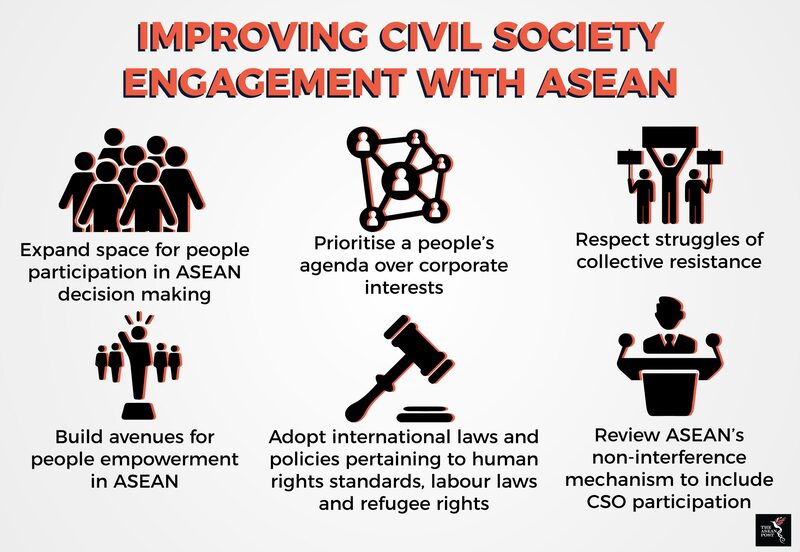 At all levels of society, ASEAN citizens should be kept in the loop of any development and be given a chance to voice out their opinions on the matter at their respective national levels. But a persisting issue with ASEAN is that it is too bureaucratic and disallows participation from civil society organisations (CSOs). When CSOs are not given a platform to provide input on particular subject matter that affects the region, it inadvertently cuts off the “ASEAN citizens” from any regional level decision. Enshrined within the ASEAN Community, is one of its three main pillars, the ASEAN Socio-Cultural Community which has by far been overshadowed by the ASEAN Economic Community. And it isn’t as if ordinary ASEAN citizens aren’t interested in regional-level issues. Although there is still plenty of work to be done to improve ASEAN awareness, the younger generation is fast realising the organisation’s importance in their daily lives. A survey of 2,170 respondents from universities around ASEAN found that 76.8% felt like they were indeed “ASEAN citizens.” 68.8% of them felt that their country’s membership in ASEAN has personally benefited them. Besides that, 51.3% of them felt that the issue of regional identity and solidarity was an important one to the Southeast Asian region. The numbers – more than anything else – demonstrates potential, that ASEAN citizens do feel that the association isn’t consigned to the doldrums of history. But can very well be shaped into acting as a force for good for its member nations. “Moving forward, the human dimension of ASEAN cooperation and integration to enrich its people from all walks of life will become indispensable to the ASEAN project,” he continued.